John Hebior of Milwaukee, Wisconsin wants to sell mammoth bones found in his property back in the early nineties. It is one of the largest mammoth skeleton ever found and is estimated to be about 12,500 years old. It is currently stored in his basement in crates and tubs. It all began in 1976 when Hebior's son found a big bone in the field. They didn't think much about it until 1993 when a neighbor's property yielded a mammoth skeleton. One thing led to another and soon enough, Hebior's land was being excavated by archaeologist David Overstreet of Marquette University. He didn't find the rest of the bones found earlier but he did find the other mammoth skeleton which is now considered to be one of the most complete in the world. Hebior says he wants to use the money from the sale of the bones to fund the college education of his grandchildren. He says it could be worth between a hundred and five hundred thousand dollars. He's currently considering a bid from the Milwaukee Public Museum but he hopes to sell it on ebay if that doesn't work out. Yeah, that might work! 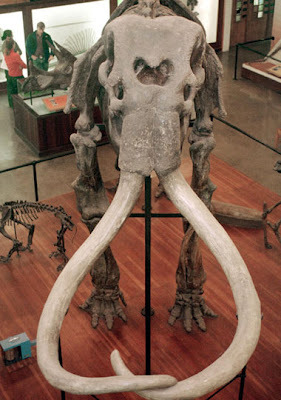 Pictured above is a mammoth skeleton in the Pratt Museum of Natural History in Amherst, Massachusetts.